I received a call the other day from a hotel sales manager who was seeking my advice because he was struggling to meet his sales quota. His real dilemma was that he recently relocated to an unfamiliar city and needed to make up some ground as quickly as possible. We talked at great length about how be planned to generate leads, how much time he would devote to prospecting and what networking strategies he would put in place. One such strategy he mentioned that got my attention was that he wanted to ramp up his prospecting activities on LinkedIn. Imagine that. A hotel sales manager who is planning on using LinkedIn to communicate and network with prospects, build business relationships and generate referrals and sales. I like this guy’s approach and if you are a sales manager who aspires to do the same, read on. Now I assume that many of you who have opened a LinkedIn account, have a 101 understanding of how it works but are not using LinkedIn as a tool to prospect for new business. Before I get in to the nuts and bolts of how to effectively use LinkedIn in order to generate leads, let me take just a minute to address something that is very important for you to consider before you make your next move. If you have not yet completed your profile or you are not confident that your current profile puts your best professional foot forward then here is a great article written by Melonie Dodaro with Top Dog Social Media called 19 Steps To The Perfect LinkedIn Profile that I encourage you to read. You will be glad you did. After you have completed your profile (that means 100%) or adjusted the content of your profile it’s time to find out where your prospects are located within the LinkedIn community. Your prospects are members of various groups on LinkedIn and now you have the opportunity to join them, communicate with them, send them direct messages (without having to deal with a gatekeeper), provide them with value (information that addresses their pain, solves their problems or stimulates the need to comment) and gives you the opportunity to become an influencer in up to 50 groups that you are eligible to join. 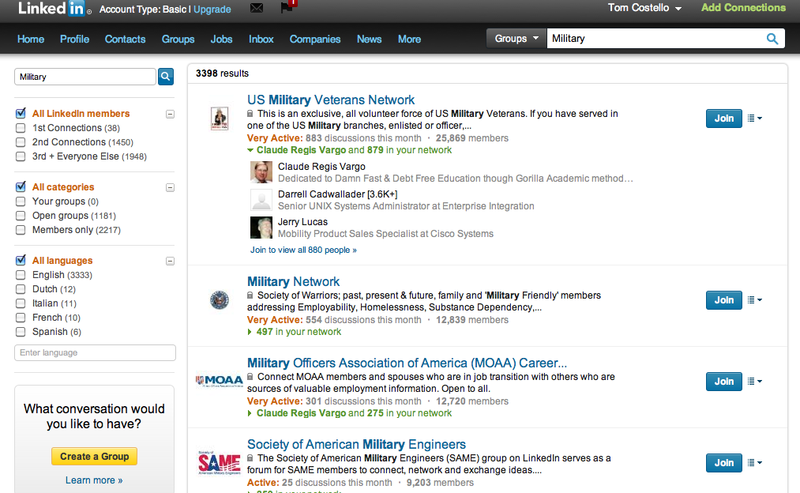 Go to the upper right-hand side of your LinkedIn profile page, click on the drop down menu next to the ‘Search’ field and select the word ‘Groups’. If you are a sales manager that is responsible for the SMERF market then type in the keyword ‘military’, as an example, and you will find that there are 3,000+ results in the search return. Drill down until you find a group or groups to that you should join! If you are responsible for the ‘Corporate’ market then type in the keyword ‘corporate’ and cull through the 11,000+ results provided in the search return. Now that you have identified and joined groups, you need to announce your arrival. If you are targeting meeting and event planners, for example, and you’ve joined a group like Independent Meeting & Event Professionals Network you should take a minute to let the other members of the group know that you have joined and look forward to actively participating in the group. In the ‘Start Discussion’ field next to your photo, add a message like ‘I am excited to be a part of (add group name here). This is just an example so let your creative juices flow. Next you will have the opportunity to ‘Add more details’ to your ‘Start Discussion’ as well as provide a link to whatever you feel is associated with you and your introduction to the group. Maybe it’s a link to your hotel’s website or possibly a link to something that you and other members may be passionate about or directly associated with like Susan G. Komen for the Cure as an example. You will most likely have a better chance to connect with other members if you can strike a cord with them as opposed to being viewed as just another hotel sales manager. The choice is yours. LinkedIn is not any different than networking in person so you must practice the same principles that you should be practicing while networking in person. Here are three thoughts that will help you to network effectively on LinkedIn. - It’s important that you invest your time well by making quality contacts and to focus your attention on eventually connecting with individuals who you would like to work with or help out in the future. As a member of the LinkedIn community you will receive requests to connect from individuals who have no interest to connect other than to expand their LinkedIn rolodex. If and when you receive a canned LinkedIn invitation, consider the intent of the sender and its long-term value to you. - Look for opportunities to provide value to other members of your group. When you read online articles that you feel would benefit other members there is a pretty good chance that the article will include a LinkedIn share link that will be located at the beginning and/or the end of the article. Click on the LinkedIn icon and LinkedIn will provide you with a pop up screen that will allow you to post the article to your profile page updates as well as to the groups that you belong to. If you elect to post the article to your groups, you will have to check that box and start typing in the first few letter of the group name and that group will populate itself into the ‘Groups’ field. When you are finished, click the ‘Share’ button and the article will be delivered. - Make sure that you think of others first before you think of yourself. If you are perceived as a giver and not a taker you will eventually become a trusted resource to other members of your group. There is nothing that will kill your reputation with members of your LinkedIn group quicker than if you are perceived as a taker. Do yourself a favor and avoid putting yourself in this position. There will be a time when you can deliver your pitch once you have established the right to do so. You will know if and when that time comes. Before you decide to connect with an individual, visit their profile page and look for some indicators that can turn a cold connection into a warm one. When you view an individual’s profile, you will see, among other things, current and previous employment, education, and a tab at the lower right-hand side of the profile called ‘Contact Info’. When you click on that link, you may be surprised at the information that you have immediate access to such as email address, telephone number, other social media accounts, websites, etc. Take advantage of this intelligence and use it wisely. You will also unveil some important clues about the individual by reading through his ‘Background’, ‘Experience’, ‘Skills & Expertise’, ‘Recommendations’, ‘Connections’, ‘Groups’ and who he is ‘Following’ which are all included in his profile. You can’t beat having this type of information at your disposal. Understanding the value of this intelligence and knowing how to use it effectively is priceless. When you decide to ask others to connect with you or to join your network, you can arrange an introduction through one of your extended connections or send a direct invitation to connect. You will have a greater degree of success connecting with someone that you have never met through a warm introduction initiated through an existing connection. Liken this method to asking for a favor and be prepared to reciprocate. If you choose the latter, make sure that you do not use LinkedIn’s boilerplate invitation… “I’d like to add you to my professional network.” This will almost assure you that your invitation will be rejected, especially from those whom you have never been in contact with before. What will you accomplish with this approach? Nothing. Tip – If your intention is to connect with someone who is not connected through your extended connections consider this. Locate that individual through a ‘People’ search. Once you have found Mr. X, click on his link as provided in the search return and you will be sent to his profile page. Since you are most likely not connected with him, you will see that his profile provides you with two options…‘Connect’ and ‘Send InMail’. Since I will not be covering the details of either of these options, you can scroll down the page to see which ‘Groups’ he is connected with. If you are lucky, he is a member of a Group that you belong to. You can then go back to that Group, click on the ‘Members’ link located at the top left-hand side of the page, and type in his name in the search field. You will then be delivered to his profile listing where, if he has elected to receive messages from other members of the group in his profile settings, you will be able to send him a direct message by clicking on the ‘Send message’ link at the far right-hand side of his profile. Caution – Ask yourself if this is the right course of action for you to take. If the answer is yes, you will need to provide a good reason why you are contacting him and that reason must be compelling enough for him to answer whatever call to action that you provide in your message or risk being perceived as a ‘spammer’ or just another salesperson. The choice is clear. Like many search tools, you can search for any individual who is a member of LinkedIn by going to the upper right-hand corner of your profile page and in the ‘People’ field, type in the first and last name of the individual who you are trying to find. In some cases you won’t know who the decision maker is within the XYZ Corporation so you will go to the same area of your profile page, choose ‘Companies’ from the drop down menu, and type in the company name. If you cover the Pharma market, as an example, and want to target West Pharmaceutical Services, then type their name in the ‘Companies’ field. If you cover the Pharma market and want to target other companies that are directly or indirectly related to this market, type in the work ‘Pharmaceutical’ in the ‘Companies’ field and you will have enough opportunities to mine over the next few weeks. You can even go one step further. In the same field, type in the name of the city where your hotel is located and all of the companies who have a profile on LinkedIn and are located in your city will appear in the search return. In closing. As a hotel sales manager, you should at least be ‘following’ your clients and their companies on LinkedIn. Make sure that you stay in touch with your client connections through LinkedIn, send them valuable information through a direct message, and when the time is right, ask if they know someone who could utilize your services and book your hotel. When you meet with a prospect for the very first time and shortly after you have sent him a thank you email, look him up on LinkedIn and invite him to connect. You have his email address so you can use it when LinkedIn asks for some credible reason how you might be connected with this individual. There are a number of tips and strategies that I did not include in this post because I want to hear what you’d like to add to this discussion. Tom Costello is CRE industrial & Office investment advisor at Marcus & Millichap a company help clients to creat and preserve wealth .